Today’s contact centers are an important conduit between your company and its customers. Whether your organization uses a contact center to enable sales, customer support, or another business function, you need to make sure this channel satisfies customer expectations for a seamless, simple experience. Traditional contact centers usually comprise rows and rows of cubicles with agents answering incoming calls and managed by one or more on-site supervisors. Sometimes the agents are equipped to resolve the incoming request, while at other times, they might connect the caller with the most appropriate resource. Virtual contact centers serve the same purpose but are operated differently. Virtual contact centers can be distributed, with agents and managers working from multiple remote locations. This enables businesses to hire the best people wherever they are located rather than be limited by available resources in a given location. In some cases, companies will set up a virtual call center and outsource the work to a third-party contact center service provider. Today’s customers increasingly interact with businesses using social media, their mobile phones and other modern communication means. Once they connect with a business using one of these methods, they expect to have their calls answered and issues resolved as quickly as possible. Behind the scenes, it can take interactions between multiple resources to resolve a customer’s problem. The key is to make it easy for customers to connect with your business however they choose and serve them expeditiously and expertly shielding – all while shielding them from back-end complexity. Unified communications – a fusion of voice, text, content, and video – is already being used to enable seamless collaboration between employees, partners, and other business stakeholders. And more and more organizations are also calling upon it to integrate multiple communication tools and enable the internal collaboration needed to address customer needs. 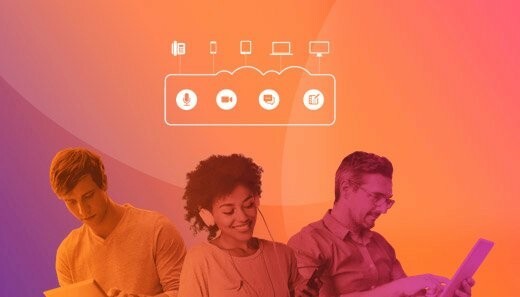 Cloud-based, unified communications (or Unified Communications as a Service) modernizes contact centers by enabling global voice, video, and messaging in a simple, elegant experience. Intelligent call routing. Automated speech recognition (ASR) and text-to-speech (TTS) allows callers to reach their desired destination – without operator involvement – based on answers to questions you choose. Workforce scheduler. Advanced contact center communications solutions include predictive analytics that help you project the number of agents and the types of agent skills needed at any given time. Performance management. By combining analytics with data from contact center interactions, certain solutions provide deep insight into customer interactions and agent performance. Ready to modernize your contact center? Request a demo of Fuze. Here's the ugly truth about meeting effectiveness.